Catherina McKiernan is regarded as one of the worlds best ever cross country runners. Born in Cornafean, County Cavan, Catherina grew up on the family farm. She played lots of sport during her school years before taking up athletics seriously in the late 1980’s. 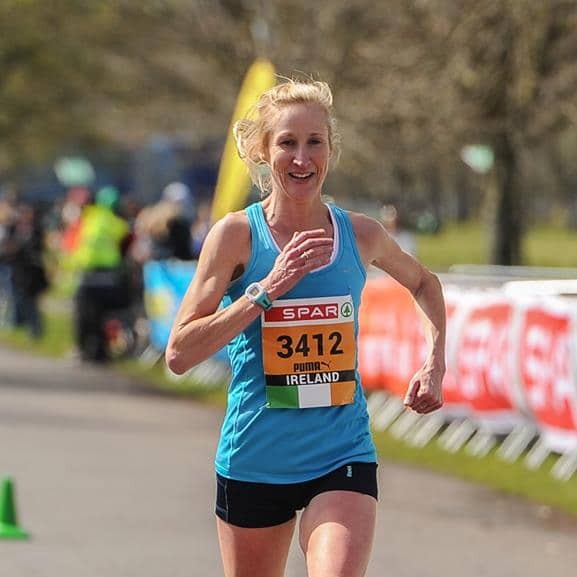 Her first major success came in 1988 when she won the Irish schools cross country title. From there, her career as a cross country runner blossomed. She won silver in the World Cross Country championships four years in succession from 1992 to 1995. In these years, she finished top of the order of merit grand prix table. In 1994, she won the inaugural European Cross Country title. In 1992 and 1996, Catherina represented Ireland at the Olympic Games. In 1997, she moved up to the marathon and ran the fastest debut ever by a woman at the time, when she won the Berlin Marathon in a new Irish record of 2.23.44. In April 1998, she became the first Irish person to win the London Marathon. In November of the same year, she broke her own Irish record to win the Amsterdam marathon in a time of 2.22.23 which is the current Irish marathon record. On the track, Catherina’s best times are 5000 metres, 14.49 and 10,000 metres, 31.08. Catherina has also won several national titles on the track and cross country and remains one of Ireland’s favourite all time sports personalities. In October 2004, Catherina retired from competitive athletics. In November 2005, Catherina published her biography, “Running for My Life”. She is now a qualified MasterChiRunning instructor, teaching the correct mechanics for effortless injury free running.